When it comes to choosing the right pillow, balance is key. Maybe you want something cooling, but cozy. Foldable, but firm. Contouring and conforming. Well, the Cooling Memory Foam pillow from Tomorrow Sleep features a dual sided construction designed to offer two different feels depending on which side you’re resting your face on. But does it have what it takes to meet the needs of every slumber style and position? Sleepopolis is here to investigate! In this review, I’ll be putting this pillow’s balance to the test by sleeping on it in every position. This way, we can find out exactly how it feels, how supportive it is, and which sleepers might benefit from it the most. No time to read my full review? Click here to skip to the summary! 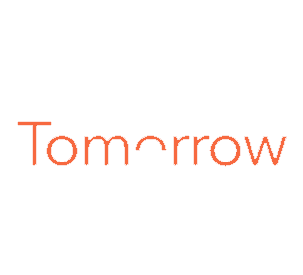 WHAT’S THIS TOMORROW PILLOW MADE OF? Yep, you guessed it. 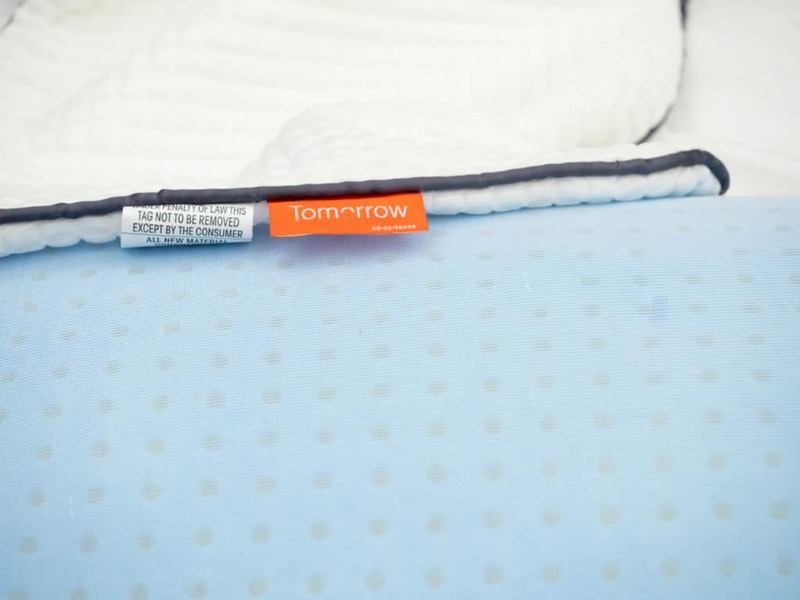 The Cooling Memory Foam pillow from Tomorrow Sleep is filled with memory foam. But it’s got some special, more hidden features to it as well. The cover fabric of this pillow is made from a blend of polyester, nylon, and polyethylene. The polyethylene, or Phase Change Material, is engineered to offer a crisp coolness that never wears out. So if you’re a sleeper who’s prone to warming up in the night, this is going to help regulate your body temperature. 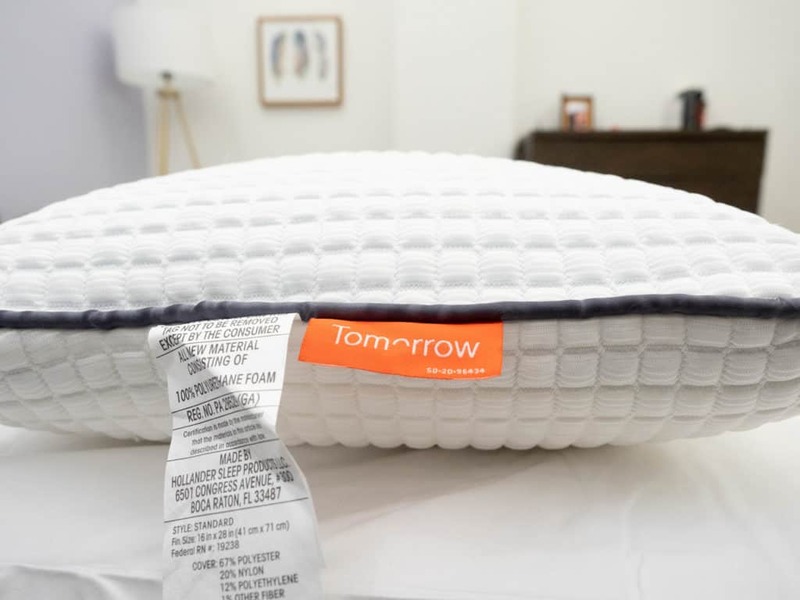 The high-density memory foam inside this pillow is built to contour to your head and neck, relieving pressure while also helping to keep your body from warming up. The density of the foam serves to isolate movement as you transition sleeping positions, while the pillow’s soft core adjusts to your body’s unique shape. Tomorrow Sleep uses CertiPUR-US certified foam, so you know it’s going to be hypoallergenic and free from any toxic dyes or chemicals. It also employs what the company refers to as a “Duocore design.” This design is intended to regulate the temperature of the pillow by dispersing the sleeper’s body heat through what’s referred to as the “cozy” side, and keeping the other side cool. One side of the foam has Phase Change Material inside of it, which further enhances the coolness. This was done to allow sleepers to flip their pillow and enjoy different temperatures and levels of comfort. This pillow has a relatively low profile, meaning its loft is not very high. 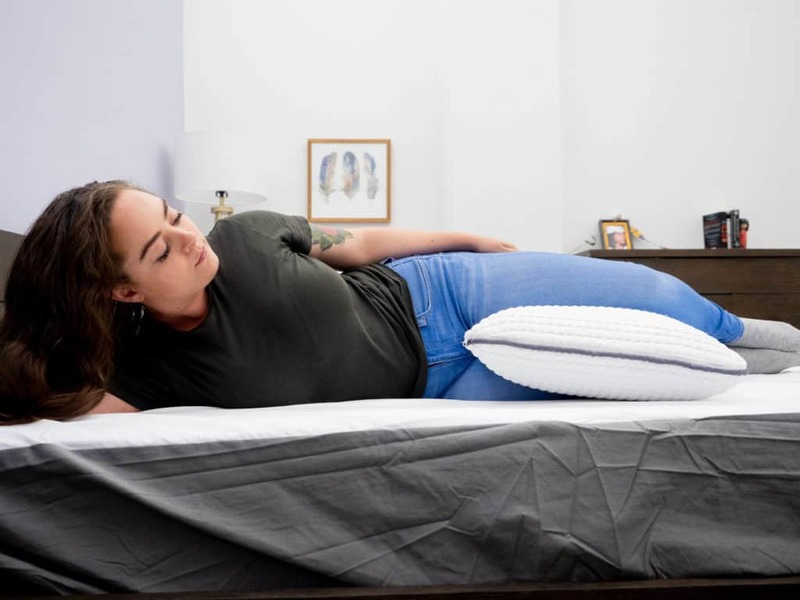 So, stomach sleepers can enjoy the body conforming benefits of this pillow without having to worry about their necks being craned out of alignment with their spines. However, because of the firmer feel and support, the folks at Tomorrow do advertise this pillow as best for back and side sleepers. HOW DOES THIS PILLOW FEEL? The first thing you notice about the feel of this pillow is how cool the cover fabric is. The Phase Change Material keeps both sides of the pillow feeling cool, albeit a little slippery. That same cooling material covers one side of the foam within the pillow itself, so one side is markedly cooler than the other. If you’re not sure which side is meant to be the cool side, just unzip the cover and check to see which side of the foam is blue. As usual, the blue side is the cooler side. The foam itself has a nice, slow response to pressure and does a nice job of conforming to your head and neck. While it is foldable, it really doesn’t have much shapeability, and it’s not at all adjustable. So, you kind of have to be compatible with the feel and support of this pillow exactly as it comes. That being said, the low profile of this pillow was particularly great for back and stomach sleeping. Because the loft is only a couple inches high, and the foam is compressible, stomach sleepers don’t really need to worry about their necks being craned upwards. Meanwhile, back sleepers would probably be compatible with the way the foam gently cradles the head and neck, keeping everything in healthy neutral alignment. 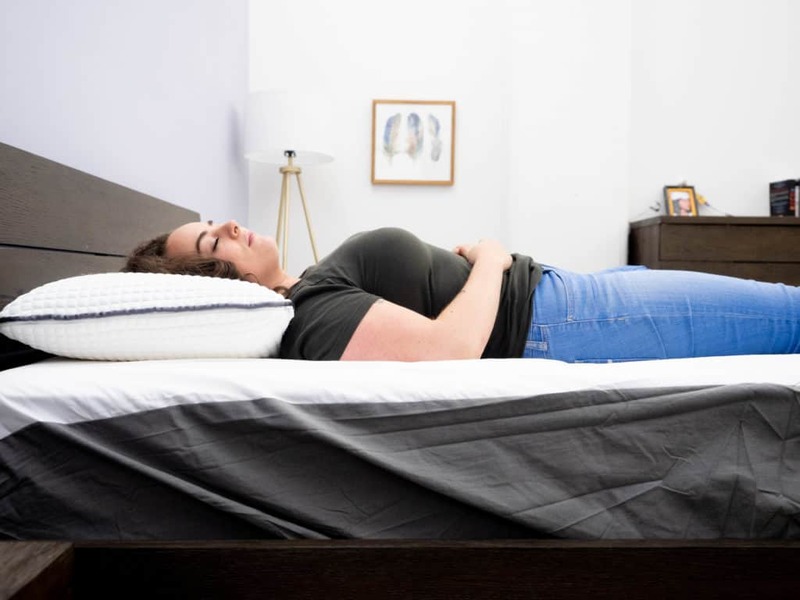 Even though the loft is low, the foam does offer a cooling, comfy feel as well as a slow response to pressure that could benefit memory foam lovers of all sleep styles. I’m a naturally hot sleeper, so I had a feeling I would be into the cooling Phase Change Material covering both sides of the pillow and one side of the foam inside. The cover fabric felt particularly icy-crisp to the touch and really served to draw the heat away from my face. I loved rubbing my hands all over the cover, and I was impressed by how both sides of the pillow seemed to remain exactly as cool as they did when I took the pillow out of its package. However, I can’t say I noticed much of a difference between the “cool” side and the “cozy” side. My initial impression was that both sides felt equally cool, but maybe I just hadn’t slept on this pillow enough! So I jumped into the supine position with the blue side of the foam facing up. Right away, I could feel the memory foam conform to my head and neck and, despite the lower loft, felt a considerably deep sink into the pillow. As far as temperature goes, it was hard to tell if I was being cooled by the foam inside or the cover fabric. Regardless, one thing is for sure: this pillow was definitely keeping my body from warming up. Memory foam is typically more prone to trapping body heat, especially when it’s a solid piece as opposed to shreds. The use of the Phase Change Material really seemed to combat that, and I felt pleased with the temperature regulating properties of Tomorrow’s memory foam pillow. Sleeping on my back, the foam cradled my head in a comforting way and I never felt like my posture fell out of neutral alignment. So, I rolled over onto my side to see if this pillow would offer the same support in the lateral position. While I did enjoy the ever-present coolness, I did not feel like I was getting the lofty level of support I prefer for side sleeping. When I’m on my side, I like a pillow with a nice lofty build and some shapeability so that I can play around with the feel, and relieve pressure in my shoulder. Lying on my side, I felt like my shoulder was bearing the brunt of my body’s weight a little bit. The low profile of this pillow combined with its lack of foldability had my neck slumped out of alignment with my head and spine, so I quickly shifted to the prone position. Ah, much better! In my experience, it is often the case that memory foam pillows are not ideal for stomach sleeping. They tend to have a firmer feel and a loftier build which, as we know, can easily throw your posture out of whack when you’re in the prone position. However, the same quality that made this pillow not-so-great for side sleeping really worked for stomach sleeping! The loft was low enough to keep my spine aligned, and I actually enjoyed the firmness. 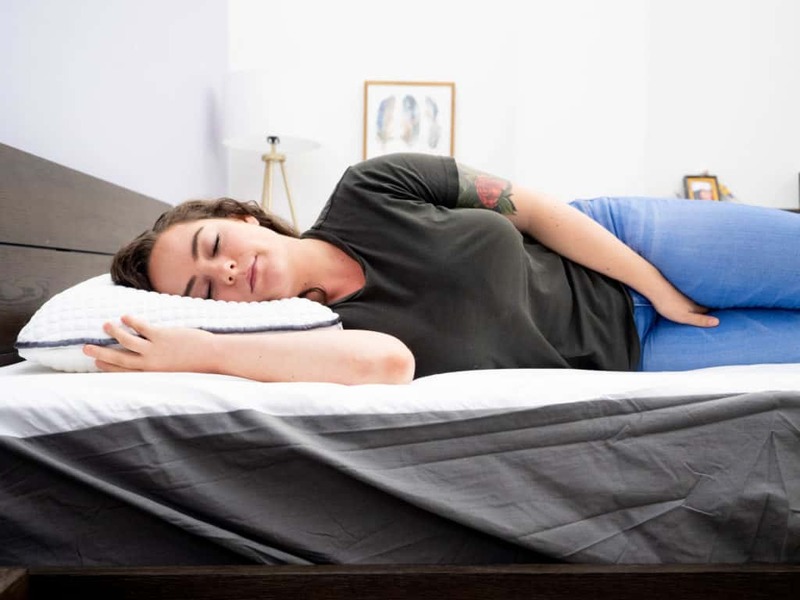 Personally, I enjoyed this pillow for stomach sleeping the most, which kind of surprised me since it’s mainly advertised for back and side sleepers. I stayed on my stomach for a while, and even though I was wishing the pillow were a bit more moldable, I felt very comfortable. I flipped the pillow over so that the cool, blue side of the foam faced the mattress to see if I noticed any difference. After close examination, I suppose I did notice a very subtle difference. But, ultimately, both sides felt pretty cool to me. When it comes to these styles of sleeping, a lot comes down to personal preference. That being said, I’ll be honest: this is not the kind of pillow I prefer for between-the-legs and under-the-arm support. It’s not that it was too flat or lost its shape; I just like something really fluffy and lofty for these sleep styles. However, I did enjoy it for between-the-legs a bit more than under-the-arm. The memory foam did a nice job conforming to the shape of my leg, and it did provide a little prop for my hips which relieved some pressure in my lower back. So, sleepers who are into memory foam and enjoy this style of sleeping should definitely give it a try! For under-the-arm support, this pillow just isn’t very huggable. Like I said, it might suit the needs of some sleepers, but I like my under-the-arm-hugger to be fluffy and cloud-like rather than firm with low loft. Everybody is different, so there are a few things about this pillow that might not be compatible with every sleeper. Not Adjustable — While the memory foam in this pillow conforms well to pressure, it is not at all adjustable. With shredded memory foam, it is often the case that you can reach in and remove or manipulate the fill, but because this is a solid piece of foam, you kind of have to be compatible with the loft and support exactly as it comes. Low & Firm — This pillow has a low loft and a medium-firm to firm feel. 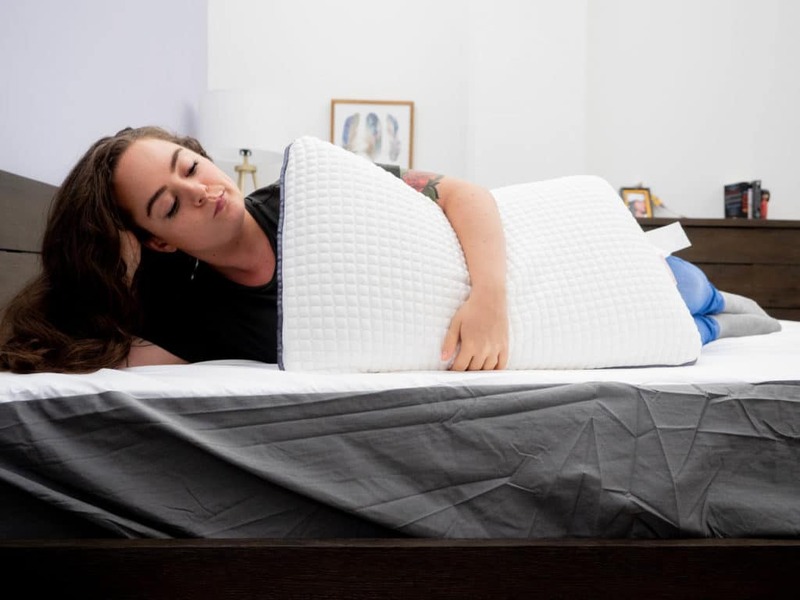 I found it to be best suited to back and stomach sleepers, but side sleepers who need something more lofty or fluffable should test this pillow before committing. New Foam Smell — New foam products often have an initial odor to them, and this pillow is no exception. Don’t worry, it’s not toxic and it is only temporary. In my experience with this particular pillow, the odor went away after a few days never to return again! SHOULD I TRY TOMORROW’S COOLING MEMORY FOAM PILLOW? 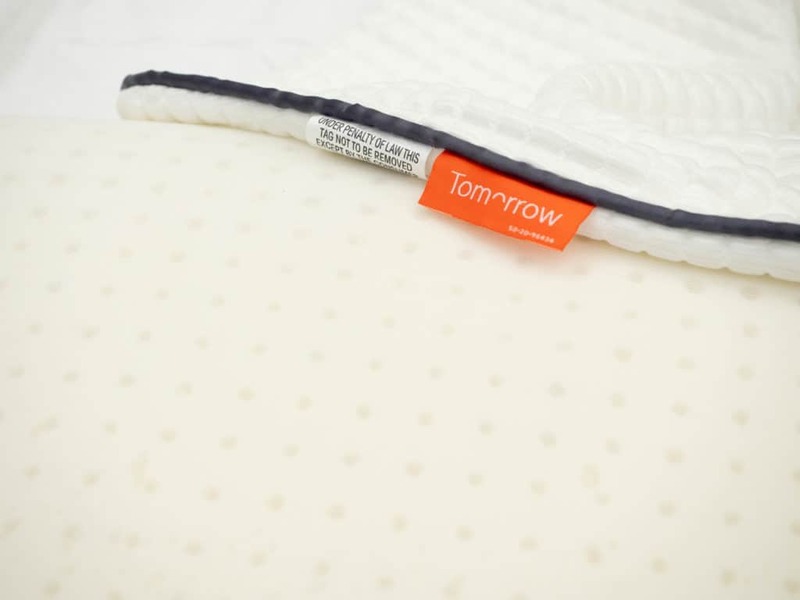 Have Allergies — The memory foam inside this pillow is CertiPur-US® Certified which is another way of saying it’s totally hypoallergenic, and free from any toxic dyes or chemicals. So, sleepers with allergies or sensitive skin can rest easy with that knowledge. Love The Sink — The high-density memory foam does a great job of conforming to pressure while offering that coveted memory-foam-sink into the pillow. Lovers of memory foam would probably be very fond of the feel of this pillow, especially back and stomach sleepers who like a low profile. 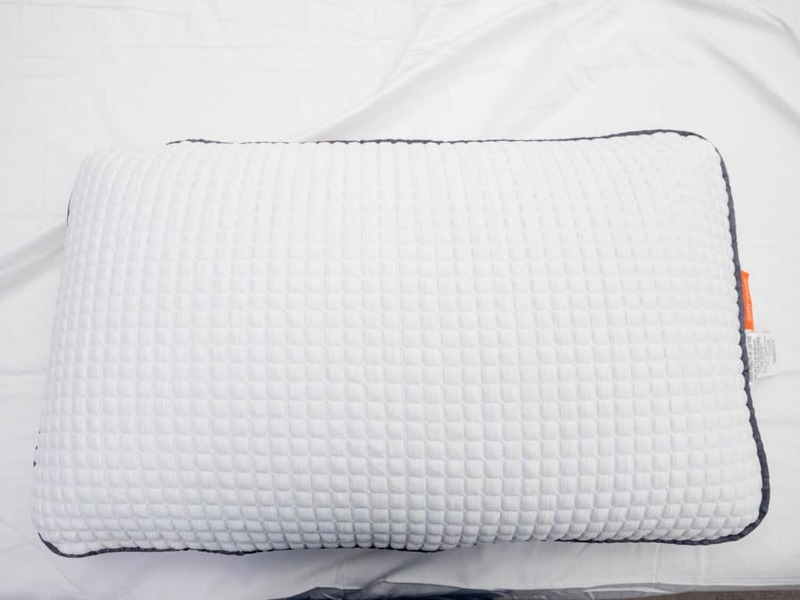 Sleep Hot — The Phase Change Material inside (and outside) this pillow is working to keep you cool all night long. So, sleepers prone to night sweats or warming up over the course of slumber might particularly benefit from this pillow’s cooling properties. Wash Care Instructions — Unfortunately, this pillow is not machine washable. Instead, just spot clean with a cool, damp cloth and mild detergent. Then, allow it to air dry. 5 Year Warranty — The warranty covers material or workmanship defects. Ready to buy a new pillow? Head over to Tomorrow Sleep to buy yours directly!